"Normal pregnancy-related hot flashes—coupled with late-summer temperatures—can be totally miserable," says Lisa Domagalski, M.D., FACOG, a clinical instructor at the Brown University School of Medicine in Providence, R.I. "Heat also exacerbates other common pregnancy-related discomforts," she adds. Not to mention what it can do to your looks. The solution? Stay air-conditioned as much as possible, drink at least eight 8-ounce glasses of water a day and check out these beauty tips. Because of hormone changes such as increased estrogen, you're more sun-sensitive now than you would be normally, says Domagalski. But an increased risk of burning isn't the only concern: Sun can also worsen melasma. This condition, better known as the mask of pregnancy, is caused by increased melanin in the skin and is often linked to elevated estrogen levels, says Alexa Boer Kimball, M.D., an assistant professor of dermatology at the Stanford University School of Medicine in Stanford, Calif. Wearing a good sunscreen all over will help keep blotches to a minimum. 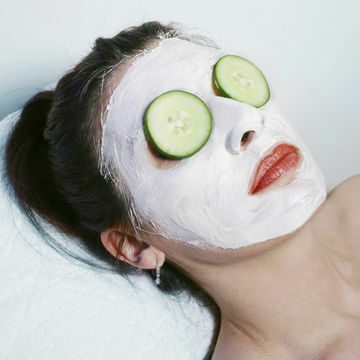 The heat-sweat-fluctuating-hormones combo may bring on breakouts, too. "We can't really predict who's going to get acne and who's going to have amazing skin during pregnancy," says Kimball. If you're in the clear, thank your lucky hormones. Otherwise, ask your doctor about oil-sopping masks. "The last thing you need is a layer of heavy foundation on your face," says B.J. Gillian, Cover Girl's makeup pro. Instead, start with a light application of a luminescent skin perfecter. Relieve heat in a flash with body and facial mists. As they evaporate, so will the heat. 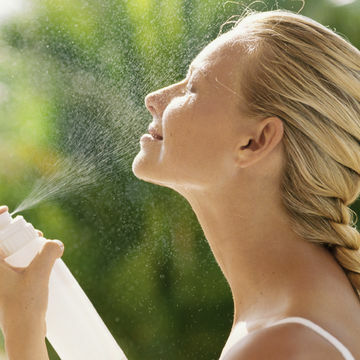 One caveat: If you spray your face, hold the bottle at arm's length to avoid inhaling too much scent. As the temperature swells, so do your ankles, legs and feet. (Pregnant women are especially prone to edema, and heat makes it worse.) To eliminate the puffiness, prop up your feet to above the level of your heart for 20 minutes. Next, fill a pot with tepid water, some ice cubes and grapefruit slices. (If you can find a few sprigs of lavender, add those, too.) Soak your feet for 10 to 20 minutes; then slather on a cooling foot lotion.